Nathan Cameron scored his third goal of the season before scoring in his own net. 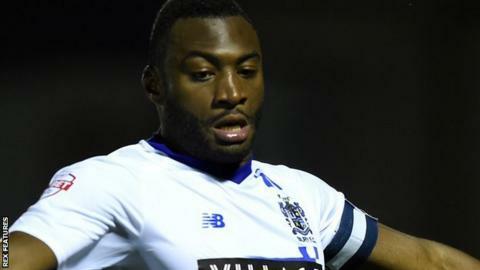 Ten-man Bury let slip a two-goal lead - and missed out on a seventh straight league win - as they drew with Wigan. Nathan Cameron opened the scoring with a bullet header into the top corner before Shakers substitute Tom Pope headed in Reece Brown's cross. Bury had Chris Hussey sent off for a second bookable offence, and a Cameron own goal then gave Wigan hope. Their comeback was complete when Craig Morgan drove in an equaliser from the edge of the box to earn a point. "I'm looking at the game overall and we certainly did enough out of possession to win the game, we were in control. "I never felt threatened until the sending off. I never felt they laid a glove on us, they got up to our 20-metre win and then if fizzled out. "The inconsistency of the referee's performance - he was making it up in the end. "Wigan's not beaten us, the situation of poor officiating has just ripped the heat out of the result." "It wasn't great to be honest. When you're coming away from home you want to be solid and not give anything away. "We said we wanted to be brave on the ball and dictate the game and I thought we were outstanding at that. "We had a lot of composure, we played our game, but we can't defend our box the way we did and give teams a two-goal start. "I know a lot about the character of the group, that's there in abundance, they never know that they're beat, but we need to be more ruthless in both boxes." Match ends, Bury 2, Wigan Athletic 2. Second Half ends, Bury 2, Wigan Athletic 2. Max Power (Wigan Athletic) is shown the yellow card. Attempt saved. Francisco Júnior (Wigan Athletic) right footed shot from the right side of the box is saved in the bottom right corner. Attempt missed. Max Power (Wigan Athletic) right footed shot from outside the box is just a bit too high from a direct free kick. Francisco Júnior (Wigan Athletic) wins a free kick in the defensive half. Craig Morgan (Wigan Athletic) wins a free kick in the defensive half. Corner, Wigan Athletic. Conceded by Nathan Cameron. Attempt blocked. Chris McCann (Wigan Athletic) right footed shot from the centre of the box is blocked. Goal! Bury 2, Wigan Athletic 2. Craig Morgan (Wigan Athletic) right footed shot from outside the box to the bottom left corner. Own Goal by Nathan Cameron, Bury. Bury 2, Wigan Athletic 1. Attempt blocked. Michael Jacobs (Wigan Athletic) right footed shot from the centre of the box is blocked. Attempt saved. Chris McCann (Wigan Athletic) left footed shot from the left side of the box is saved in the top right corner. Substitution, Wigan Athletic. Francisco Júnior replaces Jordy Hiwula-Mayifuila. Attempt missed. Jordy Hiwula-Mayifuila (Wigan Athletic) header from the centre of the box is high and wide to the right following a set piece situation. Tom Pope (Bury) is shown the yellow card for a bad foul. Attempt blocked. Max Power (Wigan Athletic) right footed shot from outside the box is blocked. Second yellow card to Chris Hussey (Bury) for a bad foul. Tom Pope (Bury) wins a free kick in the defensive half. Donervon Daniels (Wigan Athletic) wins a free kick in the attacking half. Tom Soares (Bury) is shown the yellow card for a bad foul. Corner, Wigan Athletic. Conceded by Peter Clarke. Corner, Wigan Athletic. Conceded by Danny Pugh.